The angle of roof pitch definitely factors into the roof replacement cost. A steep roof sheds water faster, although inherently more dangerous to work on. A roof with a low pitch has an increased chance for water leaks and ice damming; thus requiring a more intensive waterproofing system. 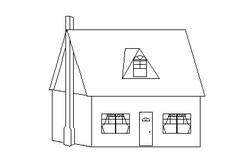 Roof pitch angle often referred to as "12/12," "8/12," "6/12" and so on. But how do you determine the degree of that angle? I'll do my best to explain with this tutorial. 1. Determine the 'rise' and 'run' of the equation. The rise equals the amount of incline in the given distance or 'run' of 12 inches. A 12 inch run considered the standard in roof angle [pitch] terminology. Using a twelve inch Level as the constant 'run,' and an eighteen inch Ruler as the variable 'rise,' find the factors you'll need to determine the degree of pitch angle. 2. Locate the tangent [in the 'tan' column on the Trigonometric table and follow the row to the left to read the corresponding degree. Divide the rise by the run to get the tangent. Let's take the term "12/12." This means a rise of 12 inches and a run of 12 inches. 12 divided by 12 gives you a tangent of 1 which corresponds with 45º. 3. Determine the angle, if you can do it safely, by taking a 12 inch Level and a Protractor up onto bare underlayment or standing seam roofs (sheet metal). Hold the Protractor, flat edge down, on the roof. Center the bottom of the Level with the center or pivot point of the Protractor. Center the horizontal bubble and read the corresponding degree measurement. Less accurate on a composite or slate shingled roof, because the angle of each shingle lessens the angle of the next. You would have to span at least three rows of shingles in order to come close to being accurate. 4. Purchase a device called an 'Angle Finder' or a 'Roof Pitch Angle Finder,' for an easier and much safer method to determine roof pitch angle. Small enough to fit into a tool pouch and operate single-handedly. With this tool, you can easily find the angle by setting it on a smooth surface, lining it up flush with the edge of the underlayment or the rake board under the side of a Gable roof. This tool features a Protractor scale and a floating indicator arrow. No math involved! 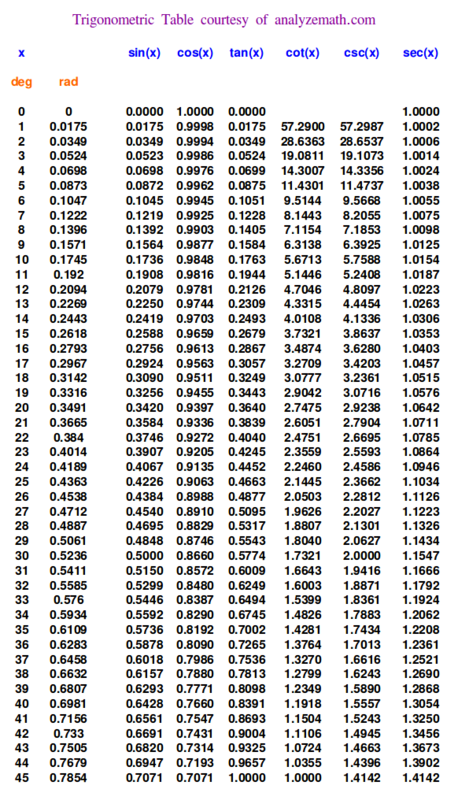 * Click to enlarge the Trigonometric Table above. * Have attic or crawlspace access? Put your Protractor or Roof Angle Finder against a roof truss or underlayment for a more accurate read!